This is the OFFICIAL GoFundMe for Hank Dietle's. Thank you for all of your requests to help. We are in the process of planning the initial cleanup and determining insurance coverage for the building. In the meantime, this fund is being setup to assist with the recovery efforts to help bring Hank Dietle's back: the very first steps of cleanup, to help our employees who are out of work, musicians out of equipment, purchasing replacement items for rebuilt space. This fund is being setup primarily for concern of the staff, community and the bands who played at Dietle’s, and for the hope of ultimately bringing music back to it. It is to help with the initial cleanup (dumpsters and disposal costs), the staff with weekly stipends (similar to amounts they received weekly before the fire), small fees the business pays regularly and possibly monthly rent for as long as the fund can pay. All disbursements from the fund will be transparent and listed. About Kiti Gartner: Kiti Gartner is a local musican who administrates the web presence, marketing and managing of music at Hank Dietle's. She is the official administrator and contact for the FaceBook page and interactions that get shared. Along with others in the community, she is coordinating efforts, donations and volunteer work being donated toward the recovery of Hank Dietle’s. For contact information, please go to www.facebook.com/kitigartner. About Hank Dietle's Tavern: Montgomery County's oldest roadhouse! We are a small neighborhood spot right across from the White Flint Mall. 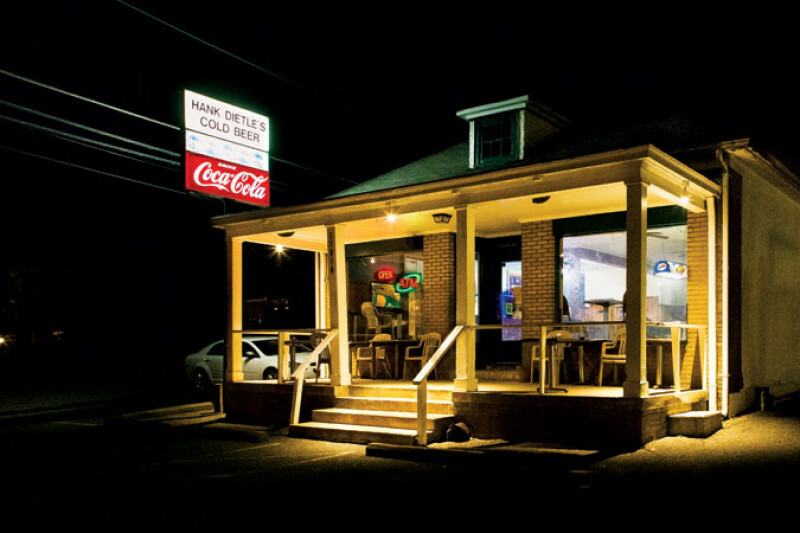 Drop by for a game of pool, kick your feet up on their front porch, you can even catch a band on given nights… We are the ONLY bar in the county where you can bring your own food or order food in. At Dietle's there are no strangers here… Only friends you haven't met. Summary of accounting for the Hank Dietle's GoFundMe. Well, although a little quiet on the homefront, the good news is that the county accepted all the blueprints and plans last Tuesday and the building permit is in process. In the meantime, we're doing all we can to gather sufficient materials and are planning an order of repair. A fair estimate has been received for the porch rebuild which will be the first step when the permit gets approved. As this gets underway, the electrical and mechanical work begins. In other news, although monies from this fund have almost been exhausted, several of the staff have found employment and will soon be getting their first checks from new employers. Week 9 of disbursements included the weekly stipend to staff ($1025) and fee payment to Montgomery County ($700). The total funds used so far is $15,775.89. Minus the 2.9% fee from GoFundMe, the total remaining today is approximately $500. Without the support of this community, bringing Dietle's back would be pretty close to impossible. Thank you all again for coming together and helping during this hardship. What a fun and special party we all had last weekend. Together, we raised $14,750, a decent amount toward repairing the porch and front of the building. Thank you everyone involved, especially Mark Segraves and The Rock Creek Council #2797 Knights of Columbus for hosting the event so graciously. Now, our wonderful architect helping with mechanical and electrical drawings was quite under the weather so the county visit is not happening until this Tuesday. We have a lot of folks wanting to get busy fixing things, so we're hoping the process goes smoothly and quickly. 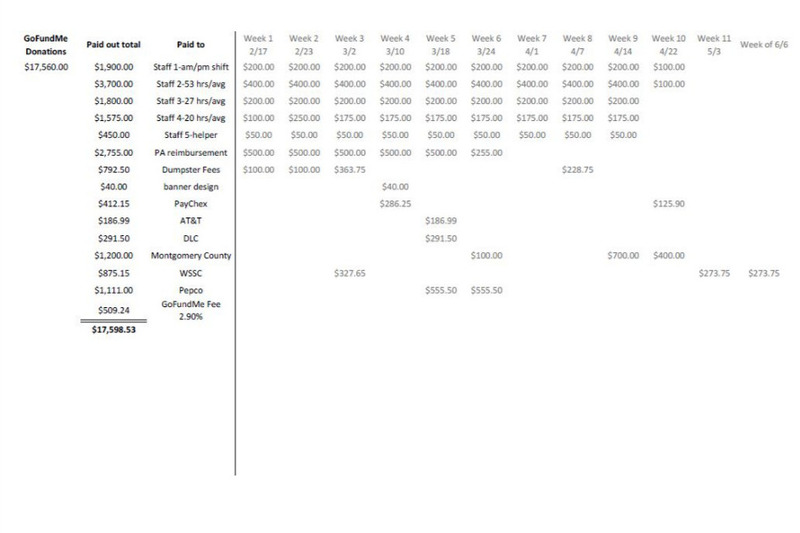 Week 7 disbursements included the weekly stipend of the staff ($1025). This week (Week 8) included the weekly stipend to staff ($1025) plus the pickup and disposal of the third dumpster ($228.75). The total funds used so far is $14,050.89. Job interviews went very well for two of the bar staff, and it's sounding like they will be employed in the next week or so! More updates soon, and thank you again for your support. Thank you for the ongoing support and interest in the recovery efforts at Hank Dietle's. Meetings with the county are ongoing and remain positive. Blueprints are being finalized with required markups (electrical, mechanical, porch repair and window placements). All will be submitted together with a scope of work on April 1st. Soon after the building permit is granted, repairs can begin! To Aaron Bay, Steve Kraft, Bill Morris, Neal Goodman, Dave Almy, Tom Helf, thank you for the significant contribution of your time and guidance. Week 6 of disbursements included: weekly stipend to staff ($1025); payment to Montgomery County for license renewal ($100); payment to Department of Liquor Control ($291.50); payment to Pepco ($555.50); final payment for reimbursement of sound equipment lost to Thomas Bowes ($255). The total funds used so far is $11,772.14. The live music fundraiser is coming up this Saturday, March 31st at the Rock Creek Mansion in Bethesda (5417 W Cedar Ln). It's going to be an incredible night of fun and music! There will be over 8 great bands and musical guests all donating their performances from 7-11:30pm (doors at 6pm). Tickets $20 at door; $50/$100 VIP available on-line at https://hankdietles.eventbrite.com.